Kate and Oli: It's St. Nicholas Eve! I read a really delightful story the other night about a old German tradition. It was titled The Legend of the Pickle and went a little something like this. 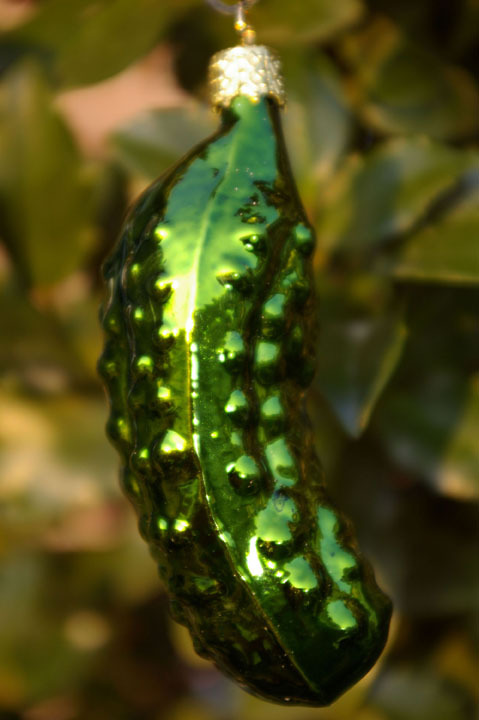 The last ornament placed on the Christmas tree every year was a glass pickle and it was hidden deep within the tree. In the morning, the first child to find it would have good luck for a year. The idea was that this would encourage the children to focus on the whole festive scene and the beautifully decorated tree as opposed to just racing to open their presents. I liked this story, I thought it was sweet. However, as a very loose scholar of Germany, I recognized some problems. First of all, in Germany, there are actually TWO present-opening days: December 6th, when presents from Sankt Nikolaus (St. Nick) are opened, and December 24th, when gifts from the Christkindl (Christ Child) are opened. Also, nobody I know from Germany has ever heard of it. The legend of St. Nick is actually one of my favorites of all time. The version I know best (and find most entertaining) is the Dutch version. St. Nick was a bishop in what is now Turkey but currently resides in Spain. In the middle of November, he rides his white horse onto a steamboat and sails to the Netherlands. The mayor and townspeople greet him when he arrives and on December 5th, he delivers a sack of presents to each child's door. How could he do this alone, you ask? Well, he doesn't. He has helpers known as Zwarte Pieten - characteristically described as black men in Moorish dress. ...I know. There are a lot of theories as to why the Zwarte Pieten have black faces - maybe they're chimney sweeps! maybe they're devils who St. Nick enslaved! These days, children in the Netherlands are told that the Zwarte Pieten work for St. Nick voluntarily and that there is a special school in Spain where they learn their trade. ...I know. If a child was naughty, the Zwarte Pieten would stuff them into a sack and threaten to beat them with sticks. If this wasn't deemed enough punishment, St. Nick and the Zwarte Pieten would actually TAKE THE CHILDREN WITH THEM. BACK TO SPAIN. I first heard this story when I was in high school and after I got over my initial discomfort and disgust, I started to appreciate the different ways that our cultures tell the same stories. It's just like Zeus and Thor - 2 versions of the same idea. If you want to hear a HILARIOUS version of the Dutch Christmas story told by David Sedaris, please check out the player below.